I have spent almost whole weekend learning Starcraft II editor and now I want to share what I have learned. This guide may serve purpose of "by newbie for other newbies". I'm going to focus on things that I personally spent most of my time to read forums, watch tutorial videos and test things. I hope my guide saves someone's time on these things. This guide focuses on doing very basic map with just terrain, resources, start locations and lighting other than default, how to make your map work and how to publish a map. There are seven pictures at end of guide. Notice you can click them and get them bigger. Ok. Let's begin to do a new map. At first you need to decide size and texture set. Test few of them before doing your actual map and try get some basic idea for your map. 64x64 is ok for 2 players and 128x128 is ok for 4 players. On pictures at end of guide I'm working 4 player map size of 128x128 and using Mar Sara textures. You can change texture set later from Map - Map info - Textures. Edges of map are unplayable area. You can change size of edges from Map - Map bounds. BASE HEIGHT is very important thing! You can change it afterwards easily from Data - Modify height field. I recommend using value of 10 at base height. Look at picture "Base height" at end of guide. On that picture base height is 0 and lighting looks weird - compare it to other pictures. On those pictures base height is 10. 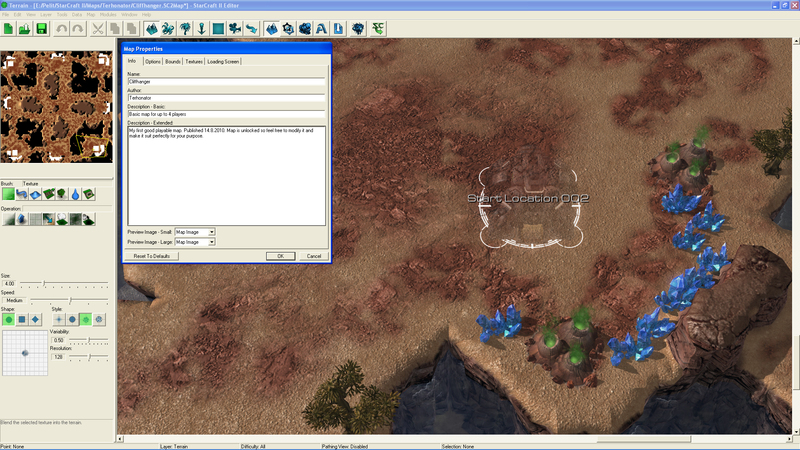 Make sure you have Terrain tool selected by pressing T or clicking mountain picture. Try how different brushes work. Try also what happens when you press CTRL at the same time you use any brush. Next you shoud do some CLIFFS to understand how water works on editor. Select cliff tool for it. Make few clicks to ground by "Raise cliff" tool. 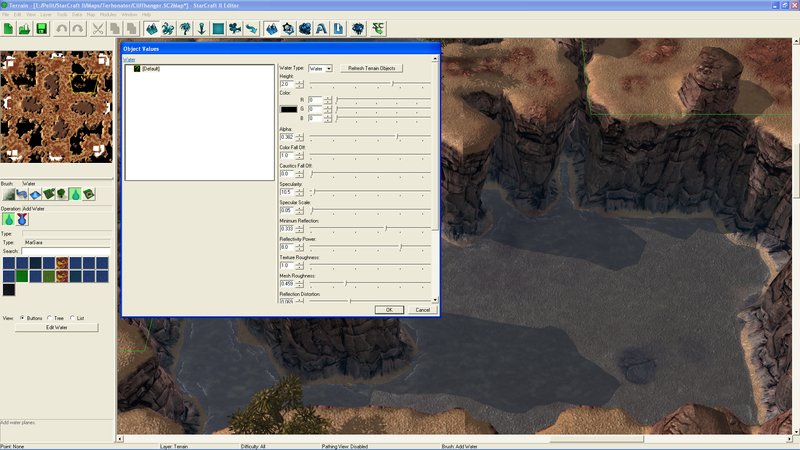 Then do few clicks with "Lower cliff" tool. Use "Lower cliff" tool near high cliffs so you can see that there are actually 3 height layers while making cliffs. Before doing water let's take look at VIDEO OPTIONS. Click File - Preferences... Many effects such as shadows and water reflections are hidden if settings are too low. Now let's do some WATER. It's very simple tool after you understand base height system. Select Water tool and select "Mar Sara" water for example. Put water on a hole you did with "Lower cliff tool". At first it you may not see any water (only green box) or it seems flow over the hole. But now we are going to put that water actually into hole. Make sure you have Mar Sara water selected and click "Edit water". There you find "Height" value - set value to 10, 9, 8... and now you see how water actually stays in a hole. Now you propably get the idea of height-system. Look at picture "Water" at end of guide. On that picture base height is 10 and water height is 2 so if you lower terrain from base level you are going to do a hole which is 8 units deep. First height level on cliffs is +2 up from base level and second is +4 up from base level. Try also what happens when you use "Height" tool on water areas. Notice that different water textures have unique height settings at default so you need to manually define height for each water type. For first map is easiest way to use only one water type so you can easily raise and low water later. 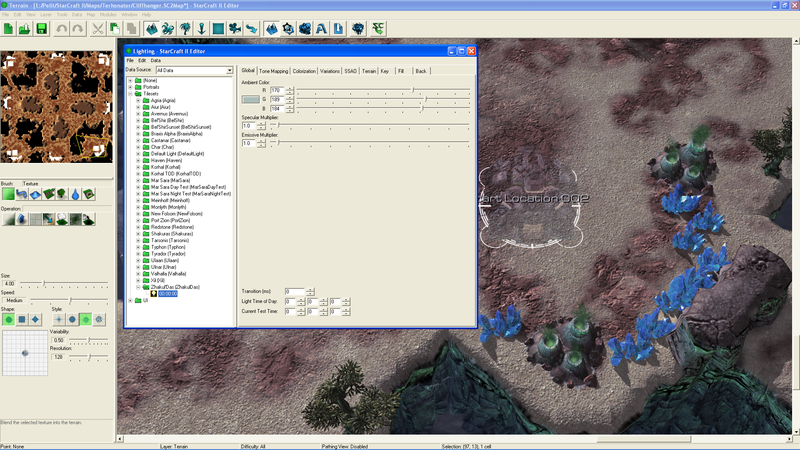 "DOODADS" are decorations for map. Click "Doodads" menu or press D. Check what sort of things you can find there and make good use for them. Turn doodads with CTRL. Double click doodad to get different variations, define height, size etc. To add minerals and vespene to your map press zerling picture or press U. Those can be found from "RESOURCE" category. Click View - Show placement grid and select "Show Near Resources" and "Show Grid at least. This helps you to place start locations and minerals. Now let's do some custom LIGHTING to your map. We are going to select one of premade lightings. Make sure that your editor shows lighting right way by clicking View - Show lighting - Game. Or press L few times. Click Window - Lighting. From Tilesets folder select some lighting to see how it would look like in game. We are going to use "Zhakul'Das" lighting to see difference well. Look at picture "Lighting" at end of guide. Before lighting actually works in game you have to do a "TRIGGER" to use other than default lighting. Click "Triggers" or press F6. Click "New action" or press CTRL+R. 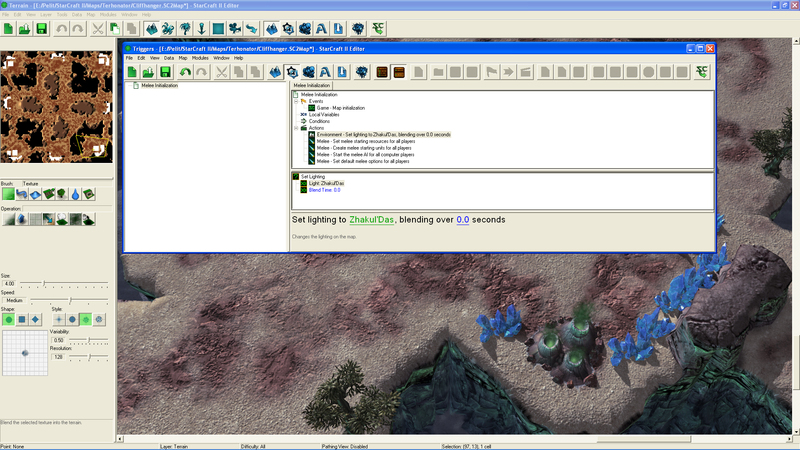 From left menu choose "Envinronment" and from right menu select "Set lighting". OK. Click green "light" word on bottom of window and from Tilesets select the lighting you want to use. After doing these things "triggers" shoud look same as in picture "Triggers" at end of guide. On that picture I'm using Zhakul'Das lighting. Test in game is your lighting working. Click "Test document" or press CTRL+F9. To define AMOUNT OF PLAYERS for your map you have to do few things. Click Map - Player properties. Leave Player 0 to Neutral and Player 15 to Hostile. For "Color" and "Race" select (Any) for all players. If you are doing 4 player map for example select "User" for players 1-4 For "Control". 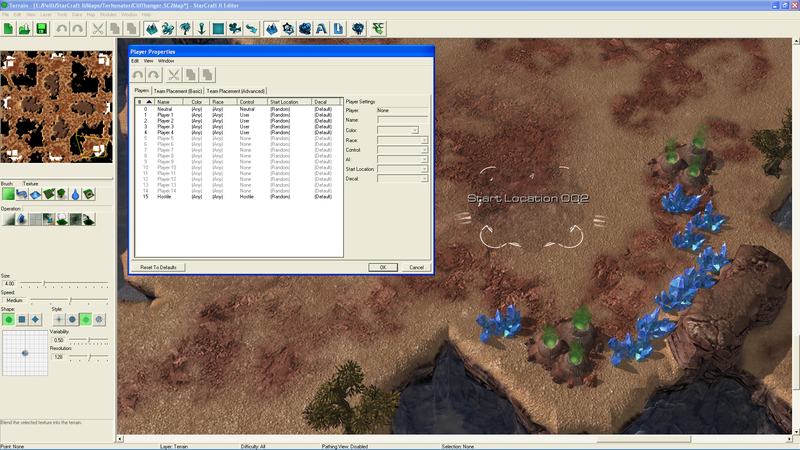 For Start locations select "Random" for all players and for "Decal" select "Default" to all players. Look at picture "Player properties" at end of guide. If you are doing 3 player map you have to put three "START LOCATIONS" there and 5 start locations if you are doing 5 player map and so on. To add start location click "Points" or press P. Start location is second from left. Put these starting locations near minerals and vespene because these are places where players begin on Melee games. Next we need to click Map - GAME VARIANTS. Click "Generate defaults" few times. There should be Melee 1v1 [Default] at least. OK. Look at picture "Game variants" at end of guide. Now we are going to PUBLISH your map. All maps must be published to battle.net before you can play them. Publishing of anything requires that some things are ok for publishing. If you have done all steps above there should be no trouble. Click Map - Map Info. Type something to Name, Author and both description fields. Look at picture "Map properties" at end of guide. Save your map. Then File - Publish... Log in to battle.net using your Starcraft account. Select locked or unlocked. For "Revision" select "Major" and for release "Private". Click "Yes" for warning screen. 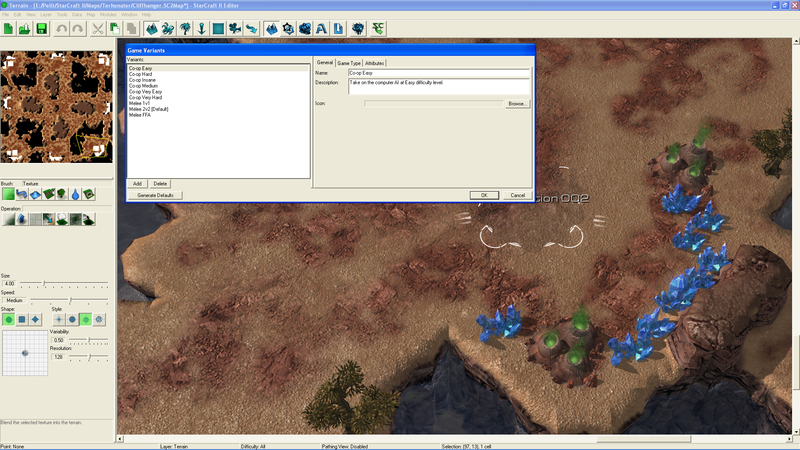 Now start Starcraft and select Multiplayer - Create game and select "My published" from dropdown menu. Invite friends for testing and enjoy your very own map! Cool! Learned a lot of important details in a short amount of time. Very useful, Thank you very much for this guide! This looks good for anybody who wants to make their first map. Greetings from the Swarm, today's host is..? Dammit Scar, it wasn't supposed to be your lunch! Good for making melee maps but lacks detail for making any good custom maps. Could be updated to cover the Terrain Texture Sets data type in some detail as to how to add your custom lighting as the default or how to make creep look funky.